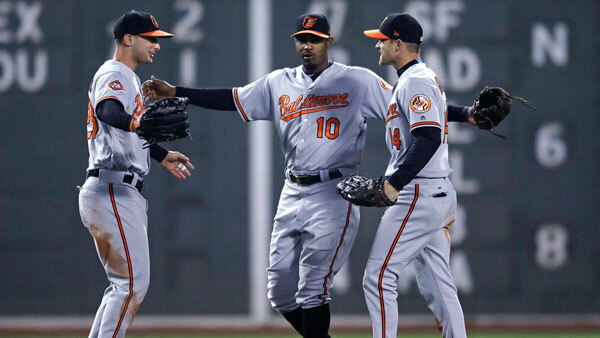 BOSTON -- Boston Red Sox President Sam Kennedy is apologizing for fans at Fenway Park taunting Baltimore Orioles center fielder Adam Jones with racial slurs. Kennedy also apologized Tuesday for a fan throwing peanuts at Jones during Monday night's game. He said the organization is "sickened by the conduct of an ignorant few." Jones, who is black, said he was "called the N-word a handful of times" in quotes reported by USA Today Sports and The Boston Globe. "It's unfortunate that people need to resort to those type of epithets to degrade another human being," Jones said. Massachusetts Gov. Charlie Baker, in a tweet Tuesday, also called the behavior by fans "unacceptable and shameful." "This is not what Massachusetts & Boston are about," the tweet said. Jones, a five-time All-Star, said he has been the subject of racist heckling in Boston's ballpark before, but this was one of the worst cases of fan abuse he has heard in his 12-year career, according to USA Today Sports. "It's pathetic," Jones said. "It's called a coward. What they need to do is that instead of kicking them out of the stadium, they need to fine them 10 grand, 20 grand, 30 grand. Something that really hurts somebody." The Orioles' 5-2 victory marked the latest testy game between the AL East rivals this season, including a dustup in Baltimore a week ago. Machado had rankled the Red Sox with a hard slide into second baseman Dustin Pedroia's left leg two days earlier. Pedroia missed a handful of games.